This badge was issued to JAMES RUDD on 01 Sep 2017. 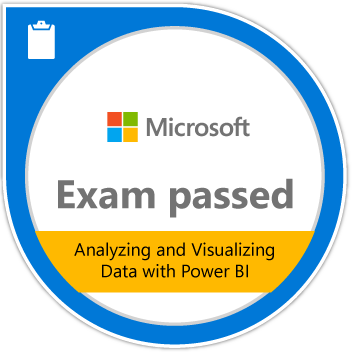 Passing Exam 778: Analyzing and Visualizing Data with Power BI validates the skills and knowledge necessary to be proficient in connecting to data sources and performing data transformations, modeling and visualizing data by using Microsoft Power BI Desktop, and configuring dashboards by using the Power BI service. Candidates demonstrate implementing direct connectivity to Microsoft SQL Azure and SQL Server Analysis Services (SSAS), and implementing data analysis in Microsoft Excel.